Winton is one of those cute little country towns where everything is just great! It is located 177Km NW of Longreach. First thing was we needed to fuel up since we hadn't since Mt Isa. At the BP they had FREE showers! When you have free camped for 3 nights in a row using baby wipes to 'wash' a free shower is really appreciated, so already we had a good feeling about the town. We came here specifically to see the dinosaur stuff, but Winton has much more to offer. For starters Winton has dinosaur feet along the main street which are the garbage bins, and it is also home to the world's largest deck chair, however since being built, the material is now ripped. While waiting for the information centre to open we wandered about the town and found “Arno's Wall”. Arno was a hoarder. He would go to the local tip on a regular basis and take home random stuff. He had a plan for his stuff though, and that plan was to build a wall that went around his property. Parts of the house were built from this wall of stuff too. There were many unique and interesting features of the wall including toilets, motorbikes, sewing machines, TVs, many wheel hubs, and car parts. Once at the information centre the lady told us about a Winton pass, that allowed us to visit 5 things around Winton so we said why not. The pass allowed us to learn the history and interpretations of the Waltzing Matilda Song, old machinery, sheep stations, opal mining, and the beginnings of QANTAS by visiting Waltzing Matilda Centre, the Qantilda Pioneer Place Museum, and some more smaller things around town. All very interesting stuff. In the afternoon we travelled 110Km west to get to the Lark Quarry with the only dinosaur stampede that has been preserved in mud. Parts of the Jurassic Park movies were based on these footprints. The guide told us that the big dinosaur was going for some water then noticed the little dinosaurs which made them run in all kinds of directions. The reason the footprints got preserved this way is because the next day or so, the waterhole slowly filled with water. The reason it was slow, is that if it was fast the prints would have been washed away. On the way back to Winton we saw a family of Emus running along side a fence. Two adults, and two younger ones. Quite funny to watch them run along the fence. I'd never seen a family before so it was very special. Once back in Winton we saw that Australian Hotel had $15 T-bone steak and chips for dinner on Thursdays! Yes please! We definitely saved the best of Winton (for us) until last. The following day we went to the Australian Age of Dinosaurs Museum. To get there you start heading East along the Landsborough Highway about 20 minutes, then turn off the highway following the signs. Normally with dinosaur exhibitions what you see is not the bones, but model casts of the bones. When dinosaurs are found it is average that it will only be 20 percent complete. To show the skeleton, bones that are found of the same dinosaur multiple times are combined to make a whole skeleton. The Australian Age of Dinosaurs are finding new breeds of dinosaurs that have never been seen anywhere on Earth. Similar dinosaurs related to the new findings have been discovered elsewhere. With what they know of the relatives, the scientists can make educated guesses to figure out the missing parts of the dinosaurs they dig up. What is interesting is they show the actual bones they have found (not casts) in a temperate controlled room like a vault with very thick insulation around the entire room, which stays at 23 degrees Celcius. There are two main dinosaurs on display named Banjo (Australovenator wintonensis) and Matilda (Diamantinasaurus matildae). They are able to use computer technologies to piece together what the rest of the dinosaur looks like, and how it moves. Next to the bones found of Banjo is a wire frame with the casts of the bones they have found of him. Next you go up to where the interesting things happen. How they get the dinosaurs out of the ground. Eventually the bones break loose from the level of rock they are in and become part of the top soil cycle where they get pushed to the surface. When this happens it reveals the next dig spot. They only do digs once a year, because every dig produces between 3-5 years of work. There is about 30 years of work in their science lab at the moment. To remove the bones they dig down to them, dig around them on one side, cover it in foil, newspaper, then plaster, wait overnight for the plaster to dry, then repeat the process on the other side. They can spend over a year working on uncovering the one cast with small chisel jack-hammer style tools. A fiddly and time consuming job run by volunteers after being trained up and you can either be apart of the dig, help with the fiddly cleaning, or both. It was a little hard to take in the incredible amount of information that was here at the museum in Longreach. We did however enjoy exploring and climbing aboard the old planes. I found the information that was at Winton in the Qantilda Pioneer Place Museum a bit more interesting, summarised, and we even found a list of old flying rules named: Regulations for Operation of Aircraft. Some included: Don't take the machine into the air unless you are satisfied it will fly. Pilots should carry hankies in a handy position to wipe of goggles. If an emergency occurs while flying, land as soon as posible. That night we went through a town called Barcaldine. There was a fascinating old tree referred to as the Tree of Knowledge as it was a very old tree and had stood witness to many rallies between the unions and the shearers. In 2006 the tree fell. A memoriam is now in its place to remember the battles the tree witnessed, the secrets it held, and the towns history. We also stopped in Charleville for a night to visit the Cosmos Centre. It was awesome getting to see the rings on Saturn through a Telescope. We reached the Gold Coast on Sunday night so our estimation of 5-10 days to get across was accurate of 7 days and I did not miss city driving one little bit. Give me the open road any day! To say we have been lazy and not writing our blog would only be half right as we have been working really hard. We scored jobs as tour guides conducting 3-4 day tours in the Red centre and have been here for nearly 9 months! It is about as far away from the ocean as you can get in Australia, 1500km North, and 1500km South. It has been a very interesting experience and we have both learnt so much. Most people think of Uluru (Ayres Rock) when you mention The Red Centre. The big red rock in the middle of Australia somewhere in the desert located roughly 450km SW from Alice Springs. Well the first thing I learnt of my 6+ weeks training is that in the centre it is not actually desert, rather a half desert (semi arid area). The amount of greenery that is out here is amazing. The rock itself is also amazing, made of Uluru Arkose sandstone the hardest type of sandstone in the world, 348m high, and the largest monolith in the world. There are so many photos of it that people know what they are expecting when they see it, so I won't bore you with that. As you drive to Uluru, don't be tricked. 150km before you get to Uluru on the drive, you will see a rock formation that, from a great distance, looks like Uluru. Named Mount Conner, it has a nickname of Foolaru because people are tricked by it. There is a lookout and rest stop for one of the smelliest drop dunnies around, but when you have got to got, you have got to go. Not able to seen from the car park, but if your cross the road, and climb the red sand dune, there is a glistening white salt lake. Rarely water in it which either evaporates or goes into the water table beneath, the salt gathers during the heavy rainfalls, then is left behind once the water goes. As I mentioned, people know what they are expecting when they come to Uluru but Kata Tjuta is often only visited because it is part of a tour, or because it is only 50km from Uluru by road located in the same National Park. Because of this, it is what us tour guides call a secret beauty. Once people are there, they are often blown away at the beauty found here as well. Many say it is just as, or more spectacular than Uluru and I would agree. Kata Tjuta means “Heads Many” in the local Aboriginal language of Pitjantjatjara spoken by the Anangu people. There are 36 domes made of conglomerate rock, and the highest dome; Mount Olga, is 546m high, nearly 200m taller than the highest point of Uluru! Kings Canyon is by far my favourite out of the places we go to on tour and even more secretive and less publicised than Kata Tjuta. Located in Watarka National Park, at the end of the George Gill ranges also about 500km from Alice Springs (or a bit less if you go via the Mareenie Loop via the West Macs). It is hard to summarise the canyon as every corner that you go around is such a different, spectacular view. Made of mostly Carmichael and Marinee sandstone sheer cliffs and domes. The 6km rim walk is superb with the optional extras of going to Cotteril's Lookout, and the Garden of Eden. The main cliff faces show off a rainbow of colours; red, orange, yellow, white, black. Be warned though, the first section of the walk is called Heart Attack Hill and for good reason. There is no free camping at either of these places but there are overnight rest places between Alice and the destinations. Camping has not been permitted in Uluru-Kata Tjuta National Park since the 1980s, but there is a public campground at Yulara about 20 minutes away, a free campsite at Curtain Springs,100km away from Uluru. There is accommodation at Kings Creek Station 50km from Kings Canyon and also at Kings Canyon Resort 10 minutes away. Closer to Alice Springs are the MacDonnell Ranges (Macs) that go for about 600km East to West which give you a whole new view of Central Australia, amazing waterholes and some spectacular lookouts. You can check out the natural ochre in the earth at the Ochre Pits, see rare shrimp, fish and other animals in Serpentine Gorge and go for a swim at Ormiston Gorge or Ellery Creek Big Hole, which in the middle of summer remain nice and cool even if the outside temperature is 45 degrees! If you are really keen you can walk along the Larapinta Track, taking you from Alice all the way out to Mount Sonder, this is about 230 kilometres. Further around Namatjira drive there is a huge meteor crater called Gosse Bluff, really cool to check out too! Most people are not aware of the beauty that the MacDonnell Ranges hold and book flights out of Alice the day after their tour. If this is you, hold up there are two things I highly recommend that are close to Alice. Follow Larapinta drive out of Alice Springs 7km to Flynn's grave, then walk the gravel path up to the right. It will take you about two hours return. Once up the top a view of Alice North and South, East and West Macs. 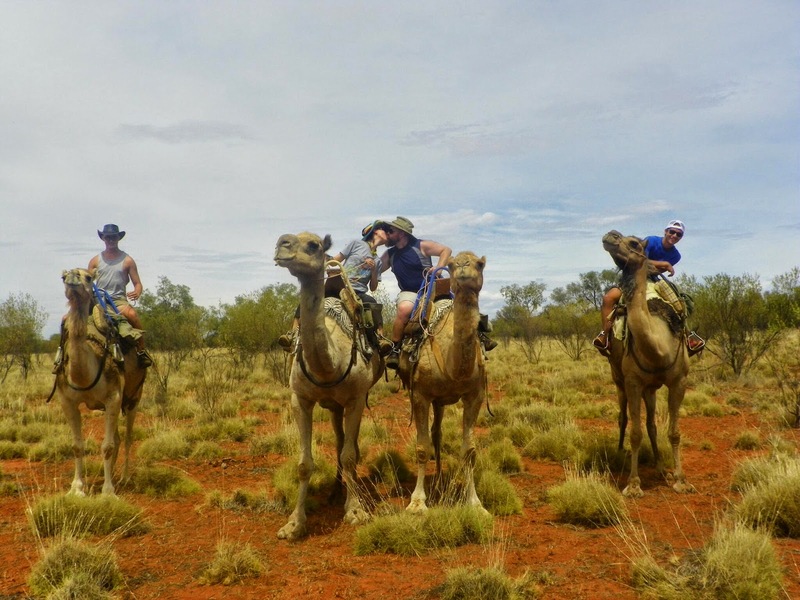 On your way back into town there is Desert Park which has daily birds of prey shows, a chance to get a photo with Australia's Largest Bird of prey the Wedge Tail Eagle, and a local Arante Aboriginal speaks of bush tucker and medicine. 100km South of Alice Springs is Rainbow Valley. Another of my favourite unheard of places. It is not on any tour itineraries but worth visiting if you own your own vehicle. To me the rock formation looks like an eagle again showing off the reds, yellows, whites and a large clay pan is in front of it. When we went there, ironically there actually was a rainbow shining in the distance. We were not lucky enough to get a photo of the rainbow. We camped there the night. It only costs $7 per person. 4X4 is recommended but not essential just watch out for some sandy washout areas. I never imagined I would spend so much time away from the ocean as I am a coastal girl by heart, but it is such a beautiful place out here. Some of the best experiences out here were sleeping in swags under the glorious stars, speaking with the local Anangu people and hear them speak about Uluru and tell their stories, and getting paid to see the wonderful places. But for now it is time to continue our travels once more.